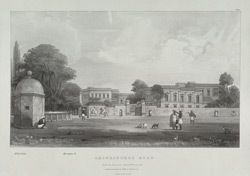 This lithograph is taken from plate 21 of William Wood's 'Views of Calcutta'. A series of artificial lakes (tanks) stretched down the length of Chowringhee Road: the Dhurrumtolah Tank at the northern limit; the Manohardoss or Colinga Tank with its corner pavilions opposite Lindsay Street; the General's tank opposite Park Street; Elliott's Tank facing Harington Street; and the Birjee Tank. Harington Street was formerly known as Graham Street.